UPDATE: I got my original remote to work again by mashing the keypad like a mad man. Now it works again. I don’t trust this remote anymore. It could stop working again at any moment for no obvious reason. The remote stopped working for my Sceptre X42GV-Naga that I bought in early 2007. This happened about 3 years ago and Sceptre mailed me another one, but now that one has also stopped working. I had a Sony RM-VZ220 universal remote that I was no longer using, so I figured that should work for this TV. There are two Sceptre codes listed in the manual and neither of them worked for me. I was able to use the search feature to eventually find one that sort of works. The code I am using is 00810. This lets me turn the TV on and off. The mute button works fine. The left and right buttons control the volume instead of the volume buttons. The up and down buttons change the channel. The channel up button is Source PC and the down button is the Source A/V. I can even bring up the settings menu to change Contrast, Brightness, etc. I would like to have more functionality, but it works for the most part. The one button that I really need that isn’t there is the Aspect button to change the Aspect Ratio from 16:9 to 4:3 and back again. We used to have batteries at work available freely to everyone who needed them. The drawer still says they are there, but the box is now empty. This is the request I wrote for 2 AA batteries. I tried to get 2 AA batteries from the supply room on the east side of the 4th floor, but the drawer marked batteries only has an empty box with the words “See Mary” written on the inside. I tried really hard to see you, but I couldn’t, so I thought I might have better luck if I walked out of the supply room. I even went all the way to the 6th floor, but I still couldn’t see you. I walked over to your desk, and I still couldn’t see you. Although I would like to see you, what I really need are 2 AA batteries for my wireless mouse. I would even be willing to walk up two whole flights of stairs to get them! Next time I should probably ask for them when the low battery indicator first comes on rather than when the mouse completely dies. 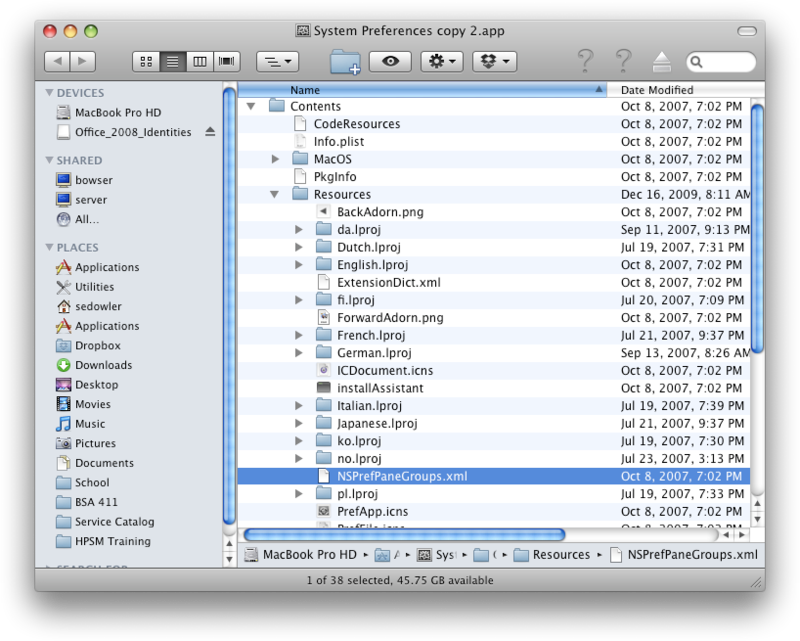 This is a great little trick to quickly make a directory of files accessible to anyone. You can do it in any OS that has Python installed, which most Linux distros and Mac OS X do. Windows does not have python installed by default, but the same thing should work from there if python is installed. This will start a web server on port 8000. This is a very simple and quick way to share a file over the network. Just send a link to the IP address of the machine. If you are behind a NAT router or firewall, port 8000 needs to be forwarded or opened, but if you are on the same network all you need to do is send them a link to http://<your_ip_address>:8000 and they can easily browse the directory you ran the command from and download any file there. When you’re finished, go back to the terminal and use Ctrl+C to end the process. UPDATE: This also works on Snow Leopard if you are having the same problem accsessing any preference panes. I have a work-issued MacBook Pro with Leopard, specifically Mac OS X 10.5.8, installed. It is a test image that was installed to test ideas about ways to administer systems for users without Administrative rights. At the end of the test, my access was changed to grant my user administrative rights on the laptop, but it still has many problems. I am waiting for the new Snow Leopard image to be completed to have my laptop reimaged. In the mean time, I have been struggling with a few issues. 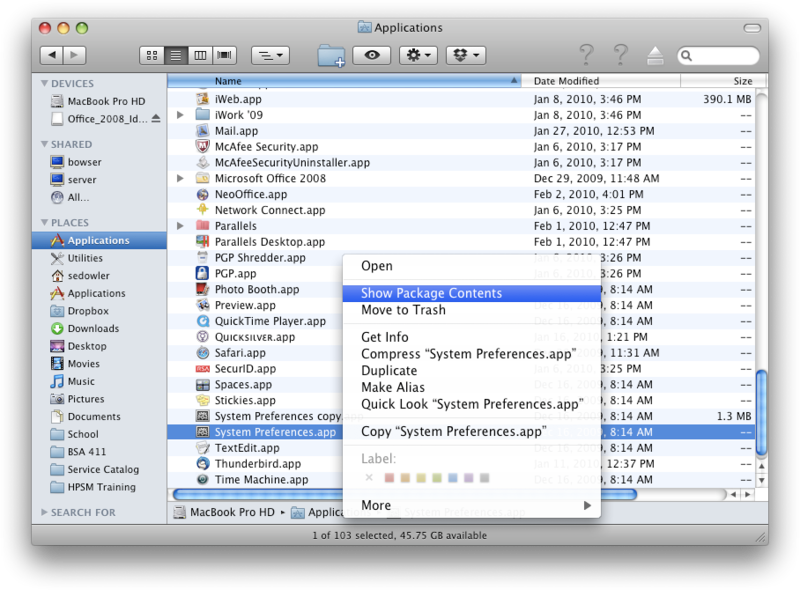 Open the Applications folder and find the System Preferences.app file. Right click or ^-click System Preferences.app and choose Create Duplicate. Right click or ^-click the new System Preferences copy.app and choose Show Package Contents. Navigate to Contents > Resources and find the NSPrefPaneGroups.xml file. Move NSPrefPaneGroups.xml to the Trash. 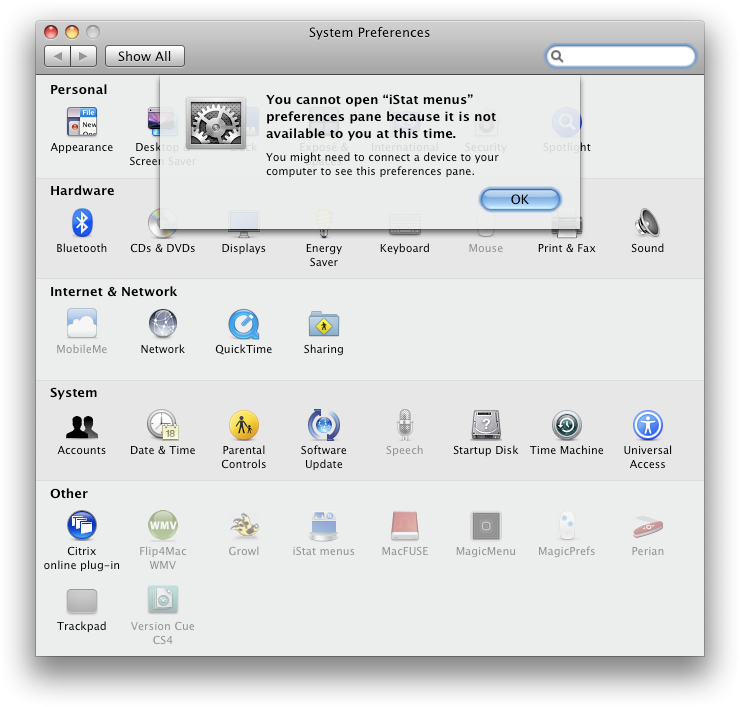 Make sure System Preferences is not running and double click System Preferences copy.app to run it. All the preference panes appear to be gone! 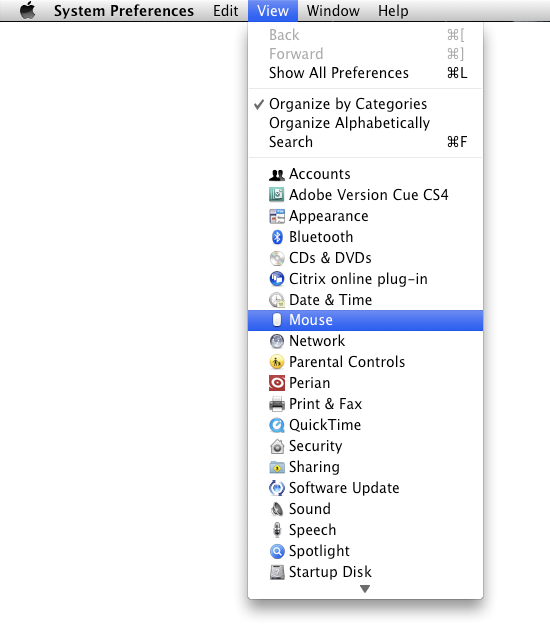 In the System Preferences application click the View menu at the top of the screen. All the preference panes are now accessible from the View menu. When you have changed the preferences you need to change, close System Preferences. Any time you need to access the disabled system preferences, just use System Preferences copy.app, otherwise you can still use the original System Preferences.app for changing system preferences normally. EtherPad is Dead: Long Live EtherPad! I announced that EtherPad was dead, look but it looks like the public outcry was heard loud and clear and now a new transition plan has been announced in which EtherPad will be released as Open Source software! New free public pads can be created again effective immediately, troche which was the biggest short-term complaint many people had with the move to close EtherPad. Now that the project will be released to the public, this is even better than if EtherPad had remained an independent entity. UPDATE: EtherPad will be released as open source software! Creation of new free pads is permanently disabled as part of EtherPad’s acquisition by Google. Google Wave is an interesting experiment, but it’s nowhere even close to being a replacement for EtherPad. It doesn’t even highlight text automatically! My hope is that these guys will get put on the Google Docs team to add realtime collaboration there. Having to wait 15-30 seconds for page updates makes the tool practically useless for simultaneous editing. Read about the EtherPad acquisition by Google and see how many people are disappointed. I started using YNAB—You Need A Budget—for a couple of years now. It’s software that implements for basic rules about how to handle budgeting. It’s much simpler than Quicken and it provides some functions that Quicken never will. Quicken is good at showing you where your money went, while YNAB will show you where your money will go. One of the biggest helps with YNAB is the shift in thinking about where the money comes from for spending. The first rule of YNAB is to build a buffer of one month’s worth of expenses, then only spend money that you earned the previous month. While you spend last months income you accumulate the buffer for next month. You always know how much money you have to spend because you already made it last month. YNAB 3 is going to be amazing! I just bought two Zinwell ZAT-970A Digital to Analog TV Converter Boxes at Amazon.com and I didn’t have to pay shipping or tax! They didn’t even ask for a credit card. I used my two TV Converter Box coupons for $40 each off the purchase of qualifying boxes. Since the price of the box on Amazon is exactly $40 and it qualifies for free shipping and no tax for Arizona residents the grand total was $0.00. Now all I have to do is wait, and when they finally get here that old TV I’ve had since I was a kid will work like a charm! These are great to have on hand in case of an emergency if all you can find is an analog TV and you need to get TV reception. Consumer Reports has excellent Digital to Analog TV Converter Box ratings. I went nuts and uploaded the clip as fast as I could when I didn’t find any hits anywhere else on Google for The Aquabats and So You Think You Can Dance. The t-molding came in on Friday and I had some time on Saturday, so I installed the t-molding and finished up the project. 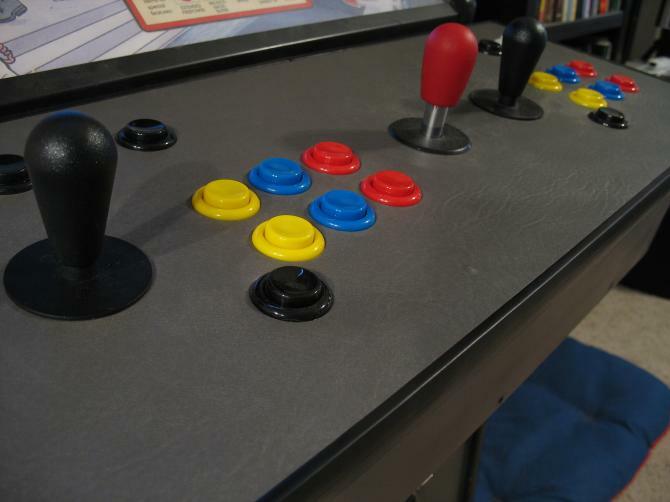 I took some pictures of the control panel on the finished arcade. I don’t have a router, but a coworker’s father was in town with all of his tools and he finally give me the means to finish the project. When I tried to install the t-molding at first there were some areas that weren’t deep enough. I used my dremel to make the slot deeper all the way around. I wouldn’t have been able to do that with the dremel alone, but since there was already a slot it helped. I have a depth guide that I attached to the dremel to make it work. I didn’t even need any glue! I just put the t-molding around the outside. Using a towel as a cushion I tapped the molding in place. The hardest part was cutting the v-shaped notches in the “t” part of the molding so it would go around the corners. Since this t-molding also had a lip I had to cut that, too. The lip was necessary to keep the vinyl down around the edges. For some reason the adhesive didn’t work very well around the edges and it wanted to come up. I attached the top piece with the controls to the bottom piece with two hinges on the front side and a catch on the other so I can flip it up from the back to work on the wiring underneath. You can see the control panel wiring in the Unfinished section of the gallery page. The Arcade cabinet came with a control panel, but it only allowed 2 buttons per player and the joysticks weren’t very good. The new configuration is also somewhat narrower so the machine can now fit through most doorways without taking off the control panel and the box it is on. Now that it’s done I’ve got exactly what I had envisioned!